LEAP Foundation DC Sending Gifts and Hope to the Youth of D.C.
On Wednesday, December 17th, LEAP Foundation DC again supported Congresswoman Eleanor Holmes Norton’s Annual Capitol Hill Children’s Christmas Party for disadvantaged D.C. youth. 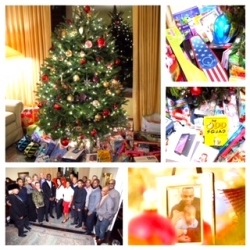 Washington, DC, December 22, 2014 --(PR.com)-- On Saturday, December 13th, LEAP Foundation DC, led by Chairman Dr. Clayton G. Lawrence, held its annual Christmas party and toy drive. Each year, the Foundation hosts its toy drive to support Congresswoman Eleanor Holmes Norton’s Capitol Hill Children’s Christmas Party, which collects and distributes gifts to children in the greater D.C. area that would not otherwise experience Christmas. Approximately 250 children received gifts from these efforts, making this the most successful year for the event to date. This year’s event marked the Congresswoman’s 24th year of working to provide Christmas presents to disadvantaged children in Washington D.C. Working in conjunction with the Uniting People with Opportunities (UPO) Inspire Foundation, and with the help of LEAP Foundation DC, the Congresswoman has been able to spread hope and holiday cheer to thousands of children and families throughout the years. The UPO Inspire Foundation opens the donation process to its members and the community in early October and collects donations through the end of November. LEAP Foundation DC then brings its employees and other community members together to host its own drive to make one last push for donations prior to the Congresswoman’s event. The families that are selected for this program each year not only receive toys, but also receive clothing, gift cards, computers/educational devices, and other much needed items. All of the families and items given to the children this year were blessed by Reverend Dr. George E. Holmes, who currently serves as a member of President Barack Obama’s National African-American Clergy Leadership Working Group and as Chaplain of the District of Columbia. To learn more about the LEAP Foundation DC, visit leapfoundationdc.org and for a 5-minute highlights video of this occasion, please visit http://vimeo.com/114946932.